Glenn Gordon Caron, a relative newcomer to Los Angeles and the television writing trade, was 50 pages into a pilot for a new detective show when something clicked and an idea fell into place. The woman in this show, he thought, was Cybill Shepherd. As it happened, Caron didn't know Cybill Shepherd. He'd worked as a writer on "Taxi" and "Remington Steele" and the short-lived "Breaking Away." He'd organized a couple of pilots, like "Good Time Harry," that dropped straight into television limbo. But most of the people he knew in television kept telling him that, as a producer, he had to learn the sanctified show-business concept of "commercial." More than a year later, the conventional wisdom about ABC's surprise Tuesday-night ratings winner "Moonlighting" is that it was designed as a vehicle for Ms. Shepherd, who plays a seething Maddie Hayes to Bruce Willis' volcanic David Addison. Like so much of "Moonlighting," whose stars recently shared "People's Choice" awards for TV rookies, that idea is off center. As a writer and producer, Caron was trying to get from the oddball--the industry perception of his talents--to the screwball, which was the comedic notion he had for "Moonlighting." "Lew Erlicht (then president of ABC Entertainment) wanted a detective show," Caron said, "and I thought, 'Great. TV's 50,000th detective show.' I was more interested in a romance, a romantic comedy, the kind of thing that really made me laugh, like (Howard Hawks' 1940 film) 'His Girl Friday.' "
Caron went from there. He got to Cybill Shepherd, who warmed to the idea, then went in pursuit of a leading man. It was a long and winding road that led to Willis, the wisecracking, eight-cylinder engine that keeps "Moonlighting" aglow on its best nights. "There's the story about the 3,000 guys we auditioned for David Addison," said "Moonlighting" producer Jay Daniel, "and that story is pretty much true. Network people told us that Bruce, who looked a little different then than he does on Tuesday nights, wasn't a 'series lead.' "
"There was a time," Caron said, "when people in the network told us the part was uncastable as we conceived it. But we found Bruce in those 3,000 auditions because we knew just what we wanted." "Moonlighting" is a chemistry lesson. The best shows turn up on Tuesday nights at 8 p.m. when the goings-on between David and Maddie are at the center. When the writing and plotting wavers, when too much time is expended actually solving a crime or letting other people do the talking, the show tilts toward the ordinary. "It's a personal show," Caron said. "We're constantly trying to explore the characters. We don't have a Bible for the show, and it seems like about half the time we get into these shows and don't know how they're going to end. But we aren't as lunatic with the characters. We know people pay attention and we want Dave and Maddie to ring true." If a single night of "Moonlighting" were to be picked out for its daring, it would probably be the black-and-white episode called "The Dream Sequence Always Rings Twice." It was Caron's handiwork at its ambitious, slightly loony best. The show, which first aired last October and has been repeated, was a signal that, at the apex of its powers, "Moonlighting" could not be trusted. About 10 minutes into the show, as Dave and Maddie were laboring over a show- business divorce and a long-ago murder in a spooky old nightclub, Caron rolled us back into old-fashioned black-and-white film. Suddenly, Maddie was a 1940s saloon singer with a bad marriage and David was a horn player on the make. Lust, followed by a murder and a double-cross, was on their minds. As a period piece, it was a stunner. As a nod toward "Double Indemnity" and "Laura" and a host of film noir offerings, it was alternately flip and adoring. 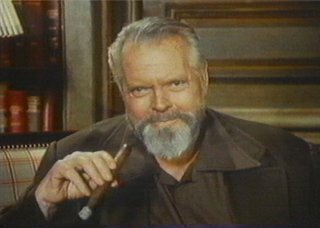 The show was introduced by Orson Welles, the director of "Citizen Kane," perhaps the most celebrated American film shot in black and white. More scrambled than hard-boiled, "The Dream Sequence" episode gave Caron a chance to stretch the limits, to fulfill his ambition to get people to pay attention. "My perception is a little dingy," Caron admits. "I'm constantly worried that we're going too far, like with David and his singing. I mean, sooner or later, that sort of thing becomes ('Happy Days') Fonzie with his thumbs up. "At the same time, I want the show to be ambitious. We wanted to do the black-and-white show for real, not with the color just bleached out. We want to test the audience and test ourselves without taking the whole thing too seriously." Caron is quick to admit that however deft the writing on "Moonlighting," it's the blending of Shepherd and Willis that is essential. Comparisons are inevitably being made to Bogart and Bacall, Gable and Lombard, Tracy and Hepburn; all of that flatters Caron and makes him a trifle nervous. "It's like saying that your show has the anarchy of a Marx Brothers movie," he said. "We're not comfortable comparing ourselves to that sort of work even if some of the principles and ideas are the same. "In this show, you have to have terrific actors. Bruce Willis is not David Addison. That's him acting. That's what an actor does. He isn't the character, isn't much like him, really. But he makes it work. And the pairing with Cybill is on the money." "As far as Maddie and David are concerned," said Jay Daniel, "the show takes the same approach to their relationship as it does with the other aspects. Audiences are so sophisticated now. They've seen all the stories, all the boy-and-girl angles. "We try to present them in a unique way. You can bring the audience right up to the edge, right to where they think they know what's going to happen, then you change it." There was, for example, a scene earlier this year where the show was wrapping up and a contrite Addison snuck into Maddie's office at night with a single rose. As the credits rolled, Addison let himself out, then let himself back in to leave a note of apology with the rose. That done, Addison left, and more credits rolled. He returned, picked up the note, crumpled the note and left the office, singing. Trying to keep everyone off balance is a way of life for Caron and PICTUREMAKER production company. 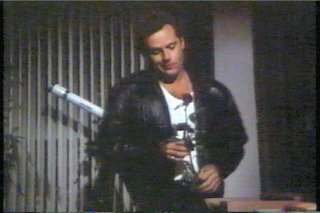 In a recent interview with "Rolling Stone," Shepherd announced that the sexual tension on "Moonlighting" was between Cybill and Bruce not Maddie and Dave. "You can't fake that," Shepherd allowed, and the remark sent gossip columnists racing to their word processors. Were Dave and Maddie about to get, in Addison's phrase, "horizontal?" Caron isn't telling, though in recent episodes, TV's new fun couple have been espied at least leaning toward the horizontal. It's just one more element in a show that has people paying attention, just as Glenn Caron hoped they would.